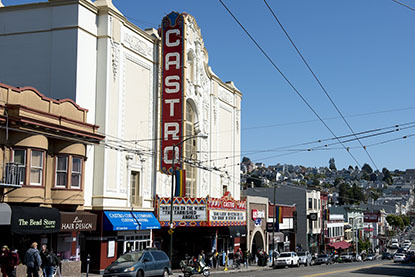 The Castro district is the heart and soul of San Francisco’s gay culture. The predominantly gay and lesbian neighborhood offers hours of shopping, a multitude of restaurants, a vibrant nightlife, and a variety of historic landmarks to visit. The F line streetcar goes from Fisherman’s Wharf down Embarcadero, up Market Street, and directly into the heart of the Castro. KITCHEN STORY for brunch and bottomless mimosas! The Castro’s distinction as a gay community began after WWII when hundreds of soldiers were dishonorably discharged from service for being gay. Finding the rent cheap and the location ideal, the discharged servicemen made the Castro their home, beginning what would become the world’s foremost gay and lesbian city. Today, the Castro district is home to stylish clothing outlets, the Human Rights Campaign store, adult content shops, cafes, and restaurants. During the day, the streets bustle with activity. At night, Castro’s numerous bars are packed and bursting with energy. Whenever you choose to go to the Castro, there will never be a dull moment. The Castro once hosted a massive annual Halloween Celebration. Every year on October 31st, the Castro section of Divisadero Street was closed off to traffic as hundreds of thousands of partiers flocked to the streets. The San Francisco Police shut down the party in 2006 after a shooting that injured nine people. Although the official Castro Halloween party no longer exists, hundreds of partygoers still arrive dressed in a variety of elaborate costumes to parade up and down the street. This unofficial promenade showcases the variety of San Francisco personalities at their very best. Visit the Castro on Halloween night to have a fabulous and unforgettable night! The Castro Theatre’s large neon sign is lit like a beacon at night, drawing people to the Castro and lending a festive, yet official feel to the district. The theatre was built in 1922 and bears the distinction of being able to project a wide variety of film formats. In addition to the modern digital formats, the theatre can project silent films at different frames per second and can show a 70mm film with a separate soundtrack. The Castro Theatre’s ornate interior creates a feeling of opulence and cultural gravity that is heightened by the live organ music played before and after films. The theatre was the site of the world premiere of the biopic Milk, about the life and times of the first openly gay official, elected to office in California—San Francisco Supervisor Harvey Milk. The theatre seats 1,407 people. The GLBT Museum highlights 100 years of GLBT history with the largest collection of GLBT historical artifacts in the United States. The museum features permanent and rotating exhibitions. Mediums include oral histories, video, photographs, periodicals, textiles, and more. General admission is $5, or $3.00 with a student ID. Pink Triangle Park and Memorial pays tribute to the 5,00-15,000 gay, lesbian, bisexual, and transgendered people who were persecuted and killed at the hands of the Nazis, and even remained prisoners after Allied troops freed other captives. The 15 white Sierra granite pylons stand as a memorial to the dead, a celebration of the living, and as hope for the future. The pylons are interspersed between gentle greenery and winding sidewalks designed to encourage reflection of self, remembrance, and education. Choose from a variety of clubs and bars any night of the week for a night of partying! Dance to your heart’s content, lose yourself in the party crowd at the Badlands or opt for a night of bar-hopping. Whichever you choose, the night is sure to be fabulous! 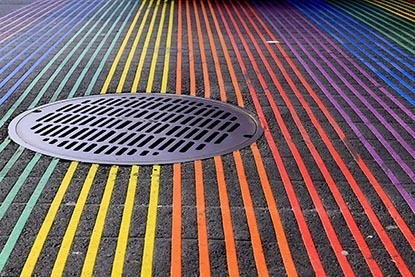 Pride: The intersection of 18th Street and Castro Street is the center of the Castro, spreading out in all directions. The iconic rainbow flag is located in Harvey Milk Plaza in the Castro and is visible from the top of Twin Peaks observation point. F Line Streetcar: Be sure to take a ride on one of San Francisco’s historic streetcars! 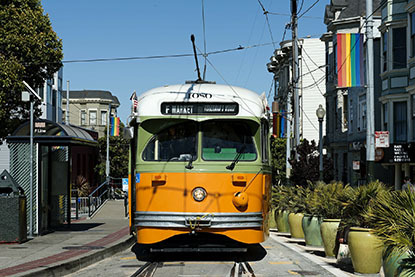 The F line streetcar turnaround is located at Market and 17th Street at Castro Street Station, running all the way up Market Street and Embarcadero Street before turning around at Fisherman’s Wharf. Twin Peaks: They are the highest points in the city. From Twin Peaks, the city unfolds in a glittering splash of lights and bustling city streets. The Bay Bridge and Golden Gate Bridge are visible in clear weather. For a closer look, you can drop quarters into the binocular tower viewers and observe the incredible panorama. Weather at Twin Peaks observation point is chilly and windy due to its height, so wear a warm jacket during the day and gloves at night.